In plants, eIF4E translation initiation factors and their eIFiso4E isoforms are essential susceptibility factors for many RNA viruses, including potyviruses. Mutations altering these factors are a major source of resistance to the viruses. The eIF4E allelic series is associated with specific resistance spectra in crops such as Capsicum annum. Genetic evidence shows that potyviruses have a specific requirement for a given 4E isoform that depends on the host plant. For example, Tobacco etch virus (TEV) uses eIF4E1 to infect Capsicum annuum but uses eIFiso4E to infect Arabidopsis thaliana. Here, we investigated how TEV exploits different translation initiation factor isoforms to infect these two plant species. A complementation system was set up in Arabidopsis to test the restoration of systemic infection by TEV. Using this system, Arabidopsis susceptibility to TEV was complemented with a susceptible pepper eIF4E1 allele but not with a resistant allele. Therefore, in Arabidopsis, TEV can use the pepper eIF4E1 instead of the endogenous eIFiso4E isoform so is able to switch between translation initiation factor 4E isoform to infect the same host. Moreover, we show that overexpressing the pepper eIF4E1 alleles is sufficient to make Arabidopsis susceptible to an otherwise incompatible TEV strain. Lastly, we show that the resistant eIF4E1 allele is similarly overcome by a resistance-breaking TEV strain as in pepper, confirming that this Arabidopsis TEV-susceptibility complementation system is allele-specific. We report here a complementation system in Arabidopsis that makes it possible to assess the role of pepper pvr2-eIF4E alleles in susceptibility to TEV. Heterologous complementation experiments showed that the idiosyncratic properties of the 4E and iso4E proteins create a major checkpoint for viral infection of different hosts. This system could be used to screen natural or induced eIF4E alleles to find and study alleles of interest for plant breeding. Cap-dependent eukaryotic translation is initiated when the cap structure at the 5’ end of the messenger RNA is recognised by the eIF4F protein complex. eIF4F is composed of eIF4E, a small protein that interacts directly with the cap, and eIF4G, a large scaffold protein . Higher plants have another form of eIF4F, the eIFiso4F complex, made up of eIFiso4E and eIFiso4G proteins . Various RNA viruses, especially those belonging to the Potyvirus genus, require plant genes encoding these translation initiation factors in order to complete their infectious cycle. eIF4E, eIF4G and the genes encoding their respective isoforms confer recessive resistance to those viruses [3, 4]. eIFiso4E was reported to have a role in Arabidopsis thaliana resistance to potyviruses Turnip mosaic virus (TuMV) and Tobacco etch virus (TEV) and concomitantly, eIF4E1 was shown to have a role in Capsicum annuum (pepper) resistance to Potato virus Y (PVY) and TEV [5–7]. Since then, variability in eIF4E, mainly associated with polymorphisms resulting in Amino Acids (AA) changes within the eIF4E protein, has been revealed as the basis for known resistance alleles in several pathosystems including Lactuca sativa/Lettuce mosaic virus (LMV) and Pisum sativum/Pea seed-borne mosaic virus (PSbMV), while eIFiso4E was shown to be involved in the resistance of Prunus domestica to Plum pox virus (PPV) [8–10]. In Capsicum annum, Pepper veinal mottle virus and Chilli veinal mottle virus are able to use both eIF4E1 and eIFiso4E and consequently, the plant resistance is associated with mutations affecting those two genes [11, 12]. Another interesting feature of eIF4E-based resistance/susceptibility is that in the same host different potyviruses specifically recruit different eIF4F isoforms. For example, in Arabidopsis thaliana TuMV specifically uses the eIFiso4F complex, whereas the Clover yellow vein virus (ClYVV) uses the eIF4F complex [6, 13, 14]. Potyviruses can affect multiple hosts. The potyviruses LMV, TEV, PPV and ClYVV all affect Arabidopsis, although their respective natural hosts would usually be lettuce (Lactuca sativa), pepper or tomato (Solanum lycopersicum), plum (Prunus domestica), and pea (Pisum sativum) (Table 1). For each of these viruses, host translation initiation factors 4E are required for infection in both Arabidopsis and in crops. PPV relies on the same isoform eIFiso4E for infection of both Arabidopsis and plum [10, 15] and ClYVV relies on eIF4E in both pea and Arabidopsis [13, 16]. Interestingly, TEV and LMV use different isoforms depending on which plant species is being infected [5–7, 9, 14, 17, 18]. It is not completely clear yet why different eIF4E protein isoforms are selected to infect different hosts. In the Arabidopsis/TuMV and pepper/TEV-PVY pathosystems, it is known that the eIF4E1 or eIFiso4E initiation factors interact specifically with VPg, a virus-encoded protein that is covalently linked to the 5’ end of the viral genomic RNA in place of a cap structure [17, 19, 20]. However, the correlation between plant susceptibility to a potyvirus and the eIF4E/VPg interaction does not extend to all pathosystems [21, 22]. So it is likely that other factors encoded by either the virus or the host are required to strengthen the interaction between the initiation factors and VPg and to specify which isoform, eIF4E or eIFiso4E, is recruited. Here we endeavoured to see whether the eIF4E or eIFiso4E proteins alone determine which complex is recruited by a particular potyvirus by analysing the TEV-susceptibility that relies on eIF4E1 in pepper but on eIFiso4E in Arabidopsis. We focussed on two pepper eIF4E1 alleles, pvr2+ and pvr2 2 (hereafter Ca.eIF4E1-pvr2 + and Ca.eIF4E1-pvr2 2 , respectively) and on two TEV strains with contrasting behaviour towards those alleles, HAT and CAA10. The Ca.eIF4E1-pvr2 + allele makes plants susceptible to both the HAT and CAA10 strains. The Ca.eIF4E1-pvr22 allele confers resistance to the TEV HAT strain, but this resistance is overcome by the TEV CAA10 strain [5, 17]. We set up a complementation system in Arabidopsis thaliana to test whether pepper eIF4E1 can restore susceptibility to a TEV-resistant Arabidopsis genotype. We show that the heterologous expression of a pepper eIF4E1 is sufficient to restore susceptibility in Arabidopsis plants devoid of the susceptibility factor eIFiso4E and is sufficient to define the resistance spectrum of the Arabidopsis host. Potyviruses for which 4E-based resistances have been reported both in a crop and in Arabidopsis were considered (Table 1). To check that the 4E proteins involved in susceptibility to potyviruses were assigned to the correct isoform group, phylogenies based on their protein sequences were built. Analyses show that 4E proteins belonging to six distantly related angiosperm plant species are correctly divided into eIF4E and eIFiso4E clades (Figure 1A). Resistance to TEV and LMV depends on different isoforms of eIF4E. A, Phylogenetic tree based on full length eIF4E1 and eIFiso4E protein sequences from Lycopersicon esculentum (Le), Capsicum annum (Ca), Lactuva sativa (Ls), Pisum sativum (Ps), Prunus domestica (Pd) and Arabidopsis thaliana (At). See methods for accession numbers. Bootstrap values over 0.6 supporting the branchpoints are represented. Resistance to potyviruses that have been reported both in Arabidopsis and in another plant species, namely TEV, LMV, ClYVV and PPV, are represented by a boxed virus abbreviation next to the 4E protein it has been shown to rely on (See Table 1 for references). B, Protein sequence alignment of Capsicum annuum and Arabidopsis thaliana eIF4E1 and eIFiso4E. Amino acids identical or similar among at least 3 sequences are highlighted in black and grey, respectively. Amino acids common only to either eIF4E1 or eIFiso4E sequences are highlighted in blue and green, respectively. Isoform-specific amino acids as defined by Monzingo et al. are marked by an asterisk. eIF4E1 box I and II, marked in red, are clusters of natural variation involved in resistance to potyviruses, as defined by Robaglia and Caranta . We focussed on plant susceptibility to the TEV HAT strain, which involves eIF4E1 in pepper and eIFiso4E in Arabidopsis. The sequences of eIF4E1 and eIFiso4E proteins from pepper and Arabidopsis were aligned to see whether sequence homologies between Ca.eIF4E1 and At.eIFiso4E could explain why the TEV uses different isoforms depending on the host (Figure 1B). However, the Ca.eIF4E1 protein is much more similar to At.eIF4E1 than to At.eIFiso4E (identity 63.8% and 42.9%, respectively). Overall sequence homologies and the signature residues previously identified  both confirm that Ca.eIF4E1 and At.eIF4E1 on one hand and Ca.eIFiso4E and At.eIFiso4E on the other hand are assigned to the correct isoform group. In total, 48 AA are specific to eIF4E1 sequences and 41 AA to eIFiso4E sequences. Among these specific residues, 23 were mutually exclusive. Furthermore, the analysis of several resistant alleles in crops has made it possible to delimit regions I and II in the eIF4E1 protein sequence where AA substitutions involved in resistance to potyviruses tend to cluster . It is possible to delimit region I and II in eIFiso4E because three-dimensional models suggest that eIF4E1 and eIFiso4E adopt a similar structure [24, 25]. A higher degree of similarity was expected in regions I and II between Ca.eIF4E1 and At.eIFiso4E, but regions I and II are in fact much more conserved between At.eIF4E1 and Ca.eIF4E1 and between At.eIFiso4e and Ca.eIFIso4E, respectively (Figure 1B). Overall then, protein sequence analyses do not explain why TEV HAT relies on different isoforms to infect Arabidopsis and pepper respectively. In pepper and in Arabidopsis, physical interaction of eIF4E or eIFiso4E with the potyviral VPg has been shown to correlate with the host susceptibility to the virus. We tested in yeast-two hybrid assays whether differential interaction between 4E initiation factors and the TEV VPg might be responsible for the different isoform requirement between Arabidopsis and pepper (Figure 2). 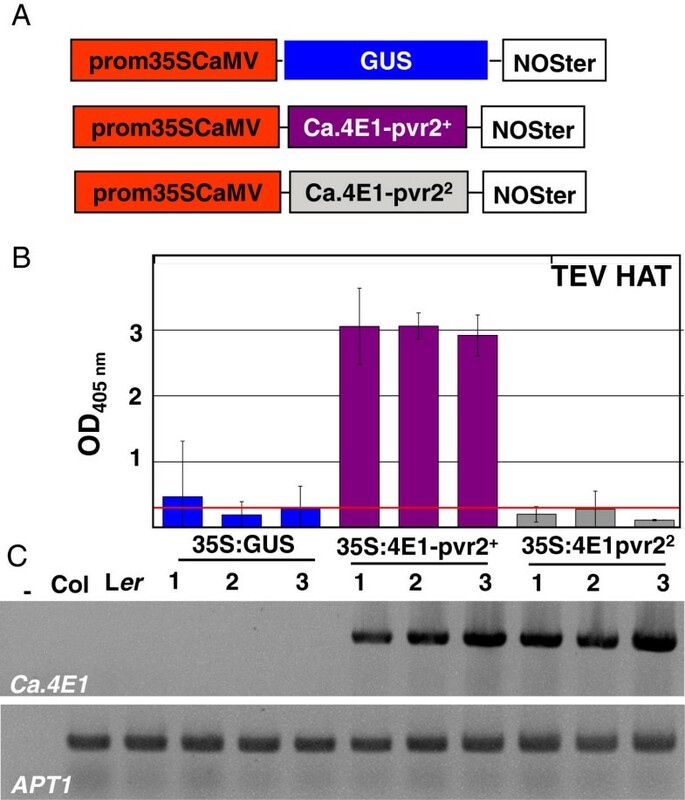 As previously reported, we found that the TEV HAT VPg strongly interacts with the susceptible Ca.eIF4E1-pvr2+ protein but not with the resistant Ca.eIF4E1-pvr22 . This differential interaction is restricted to Ca.eIF4E1 proteins as the TEV HAT VPg does not interact with the pepper Ca.eIFiso4E protein. TEV HAT VPg did not interact with either At.eIF4E1 or with At.eIFiso4E, although genetic studies have shown that At.eIFiso4E is required for Arabidopsis infection by TEV [6, 7, 26]. One explanation is that in some species the plant specificity depends on additional factors in planta that modulate the interaction between the viral proteins and the 4E initiation factor. Alternatively, additional factors may impair eIF4E1 recruitment by the virus in Arabidopsis. Arabidopsis TEV-susceptibility protein AteIFiso4E does not interact with TEV VPg in yeast two-hybrid assays. Yeast transformed with both bait (fused to the Gal4 binding domain, BD) and prey (fused to the Gal4 activation domain, AD) vectors were spotted on selective dropout medium without leucine and tryptophan (SD-LW) as a control and on selective dropout without leucine, tryptophan and histidine (SD-LWH) to check for interaction between both partners. In each case, a control with an empty vector (-) was included to confirm there was no self-activation. All combinations are shown in triplicate. If additional factors affect the interaction of TEV with eIF4E isoforms and are involved in host specificity, expression of a susceptible Ca.eIF4E1 in a TEV-resistant Arabidopsis background should not restore susceptibility. We aimed to test whether a pepper eIF4E1 could complement an Arabidopsis line lacking its endogenous At.eIFiso4E and hence resistant to TEV. However, in the Arabidopsis thaliana Columbia accession, the resistance to TEV triggered by the eifiso4e mutation is masked by the presence of RTM1, a natural dominant resistance gene that represses the systemic spread of most TEV virus strains including TEV-HAT [27, 28]. To circumvent the masking effect of RTM1 resistance, the Columbia eifiso4e line was crossed to Landsberg erecta (Ler), which carries a defective rtm1 allele. Homozygous eifiso4e rtm1 double mutants were selected in the F2 population. These plants were allowed to self-fertilise and the TEV susceptibility of the resultant F3 plants was assessed. Columbia (eIFiso4E/eIFiso4E; RTM1/RTM1), Ler (eIFiso4E/eIFiso4E; rtm1/rtm1) and the F3 eifiso4e rtm1 double mutants (eifiso4e/eifiso4e; rtm1/rtm1) were challenged with TEV HAT or CAA10. Plant susceptibility was assessed by testing viral gene expression and viral protein expression to check for systemic infection by either virus (Figure 3). As previously reported , TEV HAT could systemically infect the Ler accession but not Columbia. The eifiso4e rtm1 plants were resistant to TEV HAT suggesting that the eifiso4e KO allele is an effective and complete resistance allele to TEV HAT . The TEV CAA10 strain, which overcomes the resistance of the Ca.eIF4E- pvr2 2 allele in pepper, was unable to infect either Col or Ler (Figure 3), suggesting incompatibility or that some other form of resistance is at work. The rtm1 eifiso4e double mutant is resistant to TEV HAT and TEV CAA10 does not infect Arabidopsis thaliana L er or Col accessions. One-month-old Arabidopsis were manually inoculated with TEV HAT or CAA10 strains and assayed at 24 dpi. Wild type accessions Columbia (eIFiso4E/eIFiso4E; RTM1/RTM1) and Landsberg erecta (eIFiso4E/eIFiso4E; rtm1/rtm1) were compared to the double mutant eifiso4e/eifiso4e; rtm1/rtm1. Nicotiana tabacum cv Xanthi non-inoculated (mock) or inoculated (Inoc) plants were included as controls. A, Plants were assayed for viral coat protein accumulation by ELISA at 24 dpi. Mean values for 6 independent plants per genotype are shown and error bars represent standard errors. The horizontal black line is the susceptibility threshold. B, RT-PCR expression of the TEV VPg gene in systemic leaf tissues. APT1 is amplified as a constitutive control in Arabidopsis plants. To validate the complementation system, the At.eIFiso4E cDNA was overexpressed in the eifiso4e rtm1 mutant. As At.eIFiso4E mRNA is normally ubiquitously expressed in all Arabidopsis tissues, its cDNA was cloned under the control of a 35SCaMV promoter in a binary vector and transformed into eifiso4e rtm1 plants. As a negative control, a 35S:GUS construct, expressing the reporter gene uidA, was transformed in the same background (Figure 4A). Homologous complementation of eifiso4e rtm1 by AteIFiso4E overexpression restores susceptibility to TuMV and TEV HAT. A, Schematic representations of the T-DNA constructs inserted in eifiso4e rtm1 Arabidopsis plants. B, One-month-old Arabidopsis plants were inoculated with the TuMV CDN1 strain and assayed for viral coat protein accumulation by DAS-ELISA at 24 dpi. One T2 line transformed with the 35S:GUS construct was tested and five independent T2 lines transformed with 35S:AteIFiso4E. C, Western blot analysis of eIFiso4E protein levels in total proteins extracted from 1-month-old leaves. Actin protein levels were assessed as a loading control. D, One-month-old Arabidopsis plants were inoculated with TEV-HAT and assayed for viral coat protein accumulation by ELISA at 24 dpi. Transgenic plants were first challenged with TuMV CDN1, because the eifiso4e KO allele has been described as being resistant to this viral strain [6, 20], (Figure 4B). Four out of the five independent 35S:At.eIFiso4E T2 lines tested showed complete susceptibility to TuMV (Figure 4B), showing successful complementation of the eifiso4e mutation by overexpressing At.eIFiso4E. In parallel, At.eIFiso4E protein levels were assessed in plant extracts by western blot using a specific polyclonal serum (Figure 4C). A specific band of the expected 21 kDa size was detected in wild-type Col and Ler plant extracts but was absent in extracts from eifiso4e rtm1 plants. The four transgenic lines that were susceptible to TuMV were found to accumulate high levels of eIFiso4E. Significantly, expression of the eIFiso4E transgene was not detected in line 08, which remained resistant to TuMV CDN1. Three of the independent 35S:AteIFiso4E lines showing a high level of susceptibility to TuMV were challenged with TEV HAT and were found to be highly susceptible (Figure 4D). These results validated the efficiency of the TEV-susceptibility complementation system. In order to test whether pepper eIF4E alleles can complement the susceptibility to TEV in Arabidopsis, the full length cDNA encoding Ca.eIF4E1-pvr2 + and Ca.eIF4E1-pvr2 2 were cloned into a binary vector and transformed into eifiso4e rtm1 Arabidopsis plants (Figure 5A). When challenged with TEV HAT, five T2 lines out of six that overexpressed the Ca.eIF4E1-pvr2+ susceptibility allele accumulated a high level of viral coat protein in systemic tissues, so were highly susceptible to this strain (Figure 5B and data not shown). The pepper eIF4E1 encoded by the pvr2+ allele can therefore be used by TEV HAT in Arabidopsis instead of its heterolog isoform AteIFiso4E. In comparison, the overexpression of the Ca.eIF4E1-pvr2 2 allele in the same eifiso4e rtm1 background did not restore susceptibility to TEV HAT in any of the 6 independent lines tested (Figure 5B and data not shown). To ensure that those phenotypes were not due to differences in transgene expression, the levels of Ca.eIF4E1 mRNA in plant leaves were analysed by RT-PCR (Figure 5C). Similar large amounts of Ca.eIF4E1 mRNA accumulated in all the lines tested. Even when the Ca.eIF4E1 pvr2 2 allele is highly expressed in eifiso4e rtm1 plants, susceptibility to TEV HAT is not restored. 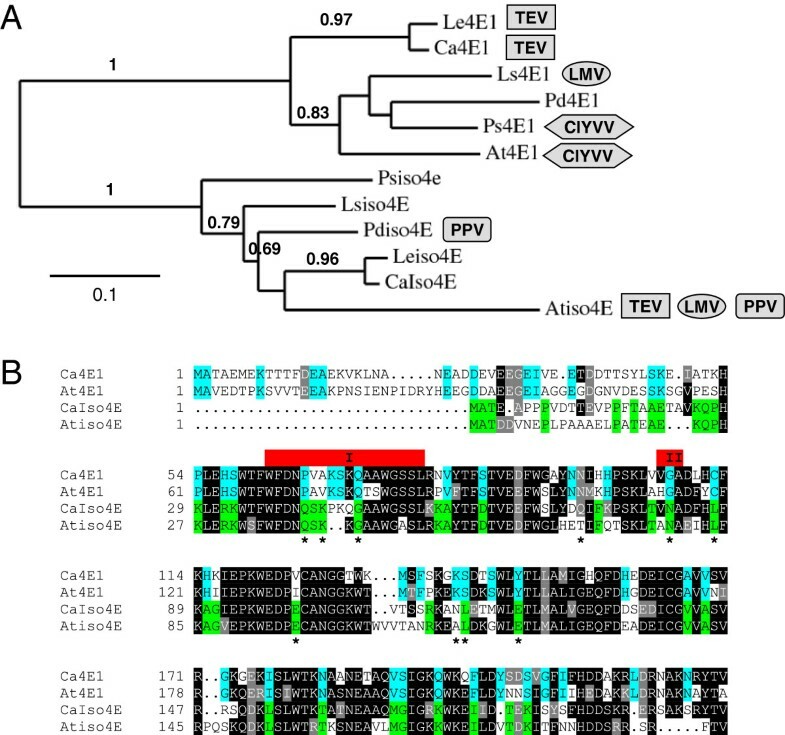 Overall, these data show that in Arabidopsis, the TEV HAT uses the Ca.eIF4E1-pvr2+ susceptible allele instead of the At.eIFiso4E, so is able to swap its 4E isoform requirement within the same host. The susceptibility to TEV could not be restored by the pvr2 2 eIF4E1 resistant allele. Hence this TEV-susceptibility complementation system is allele specific. Heterologous complementation of eifiso4e rtm1 with Capsicum annuum eIF4E1 alleles trigger susceptibility to TEV HAT in an allele-specific manner. A, Schematic representations of the T-DNA constructs inserted in eifiso4e rtm1 Arabidopsis plants. B, One- month-old Arabidopsis plants were inoculated with TEV HAT and assayed for viral coat protein accumulation by ELISA at 24 dpi. Results are shown on three independent T2 lines per construct. C, RT-PCR on total mRNA extracted from 1-month-old plants show that the Ca.eIF4E mRNA is expressed at similar levels in eifiso4e rtm1 plants transformed with T-DNA harbouring a 35S:Ca.eIF4E-pvr2 + or 35S:Ca.eIF4E1-pvr2 2 construct. The reference gene APT1 is amplified as a control. Neither Columbia nor Ler Arabidopsis plants are susceptible to the TEV CAA10 strain. The iso4e rtm1 plants transformed with 35S:At.eIFiso4E constructs were challenged with TEV CAA10 but overexpression of At.eIFiso4E was not sufficient to trigger susceptibility in Arabidopsis (Figure 6). If this lack of susceptibility is linked to an active resistance, we would expect this mechanism to remain functional in the transgenic plants expressing Ca.eIF4E1 alleles and the plants would remain resistant. On the contrary, if the resistance relies on an incompatibility mechanism, this resistance might be alleviated by overexpressing an eIF4E1 allele demonstrated to be required by TEV CAA10 in pepper. To test this, the Arabidopsis T2 lines expressing the pepper eIF4E1 alleles were challenged with TEV CAA10. Transgenic T2 plants overexpressing either Ca.eIF4E1-pvr2+ or Ca.eIF4E1-pvr2 2 cDNAs were highly susceptible to TEV CAA10 (Figure 6). Therefore, expression of a heterologous susceptibility host factor is sufficient to create susceptibility in an otherwise incompatible accession. Interestingly, the transgenic Arabidopsis plants overexpressing Ca.eIF4E1-pvr2 2 were resistant to TEV HAT but susceptible to TEV CAA10, mirroring precisely the resistance-breaking effect observed in the pepper/TEV pathosystem. 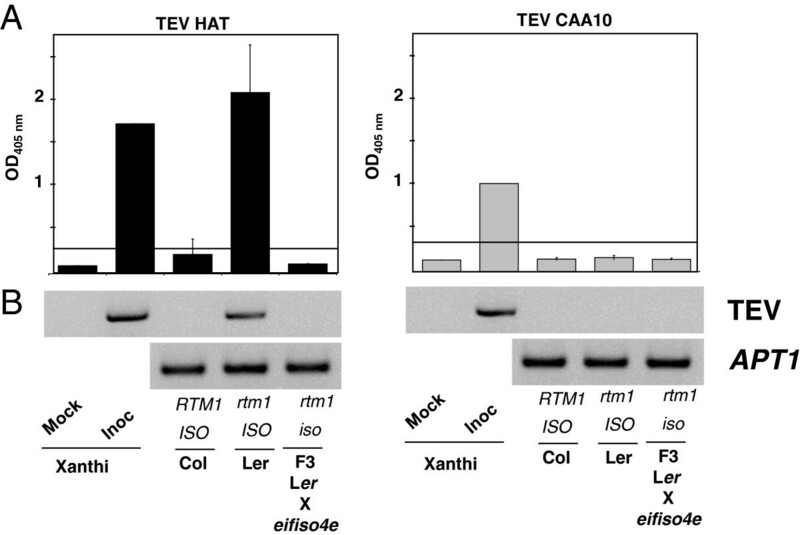 Heterologous complementation of eifiso4e rtm1 with Capsicum annum eIF4E1 alleles suppresses incompatibility to TEV CAA10. One-month-old Arabidopsis plants were inoculated with TEV CAA10 strain and assayed for viral coat protein accumulation by ELISA at 24 dpi. Three independent lines were tested for each construct. Viruses rely on host factors to complete their replicative cycle and successfully infect hosts. The plant initiation factors eIF4E and eIFiso4E and their respective partners eIF4G and eIFiso4G are examples of host factors that are required for potyviruses to infect plants. Recessive resistance (or impaired susceptibility) occurs mainly when the host factors are either absent or modified and cannot be used by the virus and this can explain some aspects of non-host resistance [29, 30]. To infect multiple hosts, the pathogen must be able to adapt to different cellular mechanisms . Here, we investigated how the TEV strain exploits different translation initiation factor isoforms to infect two plants from different dicotyledon genera, Arabidopsis and Capsicum. After validating the complementation system, we were able to restore Arabidopsis susceptibility to TEV HAT by overexpressing the susceptible pepper pvr2 + allele encoding eIF4E1. The susceptible Ca.eIF4E1-pvr2 + allele is sufficient to replace the knocked-out Arabidopsis eIFiso4E and allow the virus to perform its infection cycle in Arabidopsis. The shift in the use of eIF4E isoform by TEV between pepper and Arabidopsis is surprising given that the Ca.eIF4E1 protein is much more similar to At.eIF4E1 than to At.eIFiso4E. Furthermore, regions I and II, which are crucial in determining susceptibility to viruses, are much more similar between Ca.eIF4E1 and At.eIF4E1 than between Ca.eIF4E1 and At.eIFiso4E. In pepper, resistance to the potyvirus Pepper veinal mottle virus and its close relative Chilli veinal mottle virus has been characterized as being digenic and to rely on both Ca.eIF4E1 and Ca.eIFiso4E [11, 12], so a potyvirus can use both isoforms in the same plant. Similarly, overexpression of both eIF4E and eIFiso4E alleles from Brassica rapa in resistant eifiso4e Arabidopsis restores susceptibility to TuMV  showing that TuMV can use both isoforms as well. The TEV–4E system studied here is different in that the shift in the TEV requirement of the 4E isoform occurs between plant species and is highly specific. In other words, it is surprising that TEV HAT cannot use either At.eIF4E1 in Arabidopsis nor Ca.eIFiso4E in pepper. It is unlikely that this specificity arises from different expression patterns, notably because At.eIF4E1 is also involved in susceptibility to ClYVV so it can be assumed that the broad expression pattern of At.eIF4E1 expression makes it an available target for other potyviruses. Possibly, AA variations in regions I and II of AteIF4E1 make it incompatible with TEV, even though At.eIF4E1 does not share the polymorphisms of resistance allele pvr2 2 , V67E and L79R . This hypothesis is consistent with the lack of interaction detected between At.eIF4E1 and the TEV VPg in yeast-two hybrid assays. Gene redundancy can make it difficult to design experiments based on loss of biological function, and gain-of-function approaches offer an interesting alternative. For example, heterologous expression of four different Brassica rapa eIF4E and eIFiso4e genes in the resistant eifiso4e Arabidopsis mutant restored susceptibility to TuMV , although ectopic expression of the candidate genes can prove to be misleading . We adopted a similar strategy to test translation initiation 4E genes isolated from the more distantly related Arabidopsis and pepper. Interestingly, the precise allele behaviour distinguishing between the different viral strains was maintained in Arabidopsis. Also, expressing either Ca.eIF4E1-pvr2+ or Ca.eIF4E1-pvr2 2 alleles suppressed the incompatibility with the TEV CAA10 strain that normally cannot infect Col or Ler. Similarly, Carmovirus melon necrotic spot virus (MNSV) Ma5 is able to multiply in Nicotiana benthamiana if a susceptible melon eIF4E is supplied . Translation initiation factors are therefore a major determinant of susceptibility to positive-strand RNA viruses. To set up the experimental system in Arabidopsis, we took advantage of the natural variation in resistance at the RTM1 locus. By combining the Ateifiso4e mutation in Col accession with the natural rtm1 allele from Ler, it was possible to suppress the systemic dominant resistance to TEV in Col. This created a clear background in which to test transgenic overexpression of different eIF4E proteins and the effect on plant susceptibility. Variation in pepper eIF4E1 genes was also exploited to compare the differential resistance to the two TEV strains. A large pool of eIF4E1 alleles has already been characterized in Capsicum spp., [17, 35, 36] and the joint availability of next generation sequencing output and large germplasm collections is likely to enlarge this pool [37, 38]. However, precisely dissecting the role of these alleles in resistance may also be hindered by the presence of interfering dominant resistances in the genetic background . The genetic validation of such alleles may require difficult and time-consuming genetic studies if crosses between wild-relative species are incompatible. As well as the natural alleles available, allele-replacement technologies and mutagenesis approaches such as TILLING might offer better opportunities to generate tailor-made alleles in the near future. Testing alleles using an Arabidopsis susceptibility-complementation system, such as the one described here, could be a fast and cost-effective way to assess allele resistance to TEV in order to select the best ones for crop breeding strategies. Potyviruses can infect multiple hosts by relying on the host translation initiation factor 4E or its isoform iso4E. We show that Arabidopsis thaliana is a good heterologous system to assess whether 4E initiation factors from the crop plant pepper act as TEV resistant/susceptible alleles by overexpressing them in a resistant genetic background. Arabidopsis susceptibility to TEV that relies on eIFiso4E can be restored by the pepper eIF4E1 in a specific manner, showing that the idiosyncratic properties of the 4E and/or iso4E proteins create a major checkpoint allowing or not allowing the virus to infect different hosts. Moreover, this restoration of susceptibility is allele-specific, mimicking in Arabidopsis the behaviour of the eIF4E-pvr2 allele in pepper. These results suggest that Arabidopsis could be a good model to assess new eIF4E alleles for resistance to TEV and may also be used to assess their durability. The following protein sequences were used for the phylogeny analysis with the accession numbers shown in brackets: Pd.eIF4E1 (JX137116) and Pd.eIFiso4E (JX137117) from Prunus domestica; Ps.eIF4E1 (AAR04332) and Ps.eIFiso4E (ABH09880) from Pisum sativum; Ls.eIF4E1 (AAP86602) and Ls.eIFiso4E (AAP86603) from Lactuca sativa; Ca.eIF4E1 (AAN74644) and Ca.eIFiso4E (AAY62607) from Capsicum annuum; At.eIF4E1 (NP_193538) and At.eIFiso4E (NP_198412) from Arabidopsis thaliana; and Sl.eIF4E1 (ABF83563) and Sl.eIFiso4E (ABV23495) from Solanum lycopersicum. The phylogenetic tree was generated using phylogeny.fr . Protein sequences were aligned using MultiAlin (http://multalin.toulouse.inra.fr) and BoxShade (http://www.ch.embnet.org/software/BOX_form.html). Protein-protein interaction was tested as previously described using the Matchmaker 3 yeast two-hybrid system (Clontech). The growth of yeast colonies containing both prey and bait vectors is shown as a control on Figure 2 on selective dropout medium lacking leucine and tryptophan (SD-LW) and interactions were selected on selective dropout medium lacking leucine, tryptophan and histidine (SD-LWH). Each combination was tested in triplicate. The TEV HAT VPg was fused to the binding domain (BD) of the GAL4 while the different eIF4E1 and eIFiso4E were fused to the activation domain (AD). All plasmids have been described previously [17, 20]. All plasmids and oligonucleotides used in this study are listed in Additional file 1: Table S1 and Additional file 2: Table S2, respectively. Entry clones were prepared by RT-PCR amplification introducing the attB1/attB2 Gateway recombination sequences followed by BP clonase recombination into the pDONR207 vector (Invitrogen). All clones were checked by sequencing before further use. Other clones were obtained by LR clonase recombination reactions in the destination vector pMDC32 for CaMV 35S-driven overexpression . Arabidopsis thaliana Columbia 0 (Col) plants were used as the wild-type control and the Landsberg erecta (Ler) accession was used for its rtm1 mutant allele . The homozygous Ateifiso4e KO allele caused by insertion of a dSpm element has been described before . Plants were grown at 18 to 20°C, with 16-h light (100 μmol photons m-2 s-1 of fluorescent light) and 8-h dark cycles. For virus tests, plants were growth in the same conditions but in short days (8 h of light). For genetic crosses, immature flowers were emasculated and manually cross-pollinated. All binary vectors were transformed into Ateifiso4e rtm1 Arabidopsis plants using the floral dip method . All T1 and T2 plants were selected on germination medium plates supplemented with 15 mg/L hygromycin B. About 10 independent T1 plants were selected for each construct and allowed to self. The presence of the transgene in T2 plants was shown by plant resistance to hygromycin and PCR genotyping. The eifiso4e rtm1 background was also confirmed by genotyping (Additional file 3: Figure S1). Control plants expressing the GUS reporter gene were checked by GUS staining (data not shown). The TuMV CDN1 strain  and both TEV HAT and CAA10 strains  were propagated on turnip (Brassica rapa) and Nicotiana benthamiana cv Xanthi, respectively. Viruses were inoculated on 1-month-old Arabidopsis and TuMV and TEV viral accumulation was assayed after 24 days by ELISA using respectively AntiPoty (Agdia) and AntiTEV (Sediag) antisera and detection sets. All results presented are mean values from 6 independent plants per genotype and error bars represent standard errors. The threshold for susceptibility is represented by a line on each graph and refers to an absorbance value at 405 nm in ELISA equal to three times the mean value for healthy controls. Both Yolo Wonder and Florida VR2 pepper accessions were used as controls in all viral infections throughout this study (Additional file 4: Figure S2). The Ateifiso4e mutant allele is caused by the insertion of a defective dSpm element into the second exon of AteIFiso4E (At5g35620). The wild-type allele was PCR-genotyped on genomic DNA with primers Z2835 and Z2836 and the mutant allele was genotyped using primers Z2835 and Z524, an oligonucleotide that hybridises at the 3’end of the dSpm element. The rtm1 allele was genotyped with a CAPS marker as follows. A 340-bp DNA fragment covering the RTM1 locus was amplified with primers Z2322F and Z2323F and digested with restriction enzyme HinfI. The fragments resulting from the Col RTM1 allele and the Ler rtm1 alleles resulted in main bands of 260 bp and 298 bp, respectively. The complete AteIFiso4E cDNA sequence was cloned into the expression vector pET15b (Novagen). Recombinant His-tagged AteIFiso4E protein was produced, purified and used to produce polyclonal antibodies in rabbits (New Zealand White, SPF) by Proteogenix (Oberhausbergen, France). The resulting serums were purified against the His-tagged AteIFiso4E protein by affinity purification. For western blot analysis, total proteins were extracted from 1-month-old leaves in Laemmli buffer. Equal amounts of protein extracts were electrophoresed on an SDS-polyacrylamide gel and blotted onto Hybond ECL nitrocellulose membranes (GE Healthcare, Buckinghamshire, UK). The anti-AteIFiso4E serum was diluted at 1/2000 and combined with a secondary goat anti-HRP-labelled anti-rabbit serum (Sigma-Aldrich) diluted at 1/5000. As loading control, monoclonal anti-plant actin antibodies (1/2000 dilution) (Sigma-Aldrich) were used with HRP-labelled rabbit anti-mouse serum (1/2000 dilution) (Sigma-Aldrich). HRP activity was detected using the LumiGLO Reserve chemiluminescent substrate kit (KPL, Les Ulis, France) and X-OMAT LS films (Kodak). Total RNA was extracted using TRI-Reagent (Sigma-Aldrich) from 1-month-old leaves. Contaminating DNA was removed by DNAse I treatment. RT-PCR was performed with AMV reverse transcriptase (Promega) on 1 μg of total RNA according to the supplier’s instructions. ADENINE PHOSPHORIBOSYL TRANSFERASE 1 (APT1, At1g27450) was used as a constitutive control. C. annuum eIF4E1 and APT1 cDNA were amplified using Z3221-Z3222 and Z1734-Z1735 primer pairs, respectively. This work was supported by grants from the French National Research Agency (ANR) in the framework of the MOVIe project (ANR-08-GENM-128). We thank Luc Sofer and Frédéric Revers for providing the rtm1 dCAPS marker. JLG designed the experiments. JE, AMa, CCallot, AMo and JLG carried out the experiments. SL contributed new reagents. CCaranta and JLG wrote the manuscript. All authors read and approved the final manuscript.